Of advanced age, as its very name indicates (Criação Velha means Old Creaton), it is still the true home of verdelho wine, with golden grapes that ripen on large beds of lava at the place called Lagido. Place to visit: Church of Nossa Senhora das Dores. It is still called Prainha do Galeão (literally, Little Beach of the Galleon) because of the ship built there by Garcia Gonçalves Madruga in the 16th c. to pay debts owed to King João III. Magnificent bay. Belonging to the parish is the locality called Terra do Pão, with a small church dedicated to St Margaret. Place to visit: Church of São Caetano. One of line oldest villages in the island. Its foundation dates back to 1482. 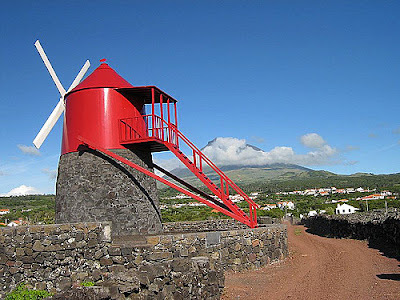 An alternative port for connections with Faial and one of the last existing bases for whale hunting. Land of lace-makers, who produce excellent crochet work. Place to visit: Church of São Mateus. Picturesque village in an area or vineyards and orchards. Birthplace of the late cardinal, José da Costa Nunes. Place to visit: Church of Nossa Senhora das Candeias.